But every now and then, there’s a record so revelatory and essential, it seems almost necessary to learn how said album came to pass. There are certain records I wish I could have seen made. The Beatles is one of those records. Known most commonly as “The White Album,” The Beatles is to me the sound of a band making the most of what was slowly becoming a bad situation. The best art often comes from pain and misery. The White Album is no exception. Fifty years after its release (let that sink in), The Beatles has been reissued as a deluxe box set, featuring six CDs and a blu ray disc. Listeners will find a brand new mix of the original album (courtesy of Giles Martin), a mono mix, a 5.1 surround mix, 27 tracks of demos, rehearsals, jams, and alternate takes demonstrating what all went into this two-LP set from 1968. The more cynical among will say the original release was bloated to begin with. The White Album, they say, would have been much better as a tight single LP. I disagree. There may be one or two bits of filler, but every song is compelling for its own reasons. The rehearsals and demos make all the songs that much more compelling. The packaging for this set is simplicity at its finest. A thin, translucent plastic shield covers the stark, white packaging that looks more like a thick book than an LP. With the shield on, you get a look at the four photos that originally graced the interior gatefold of the album on the front, and a full track listing on the back. Remove the shield and you are treated to the original white packaging and embossed lettering of the original album cover. Pretty cool! Each CD and blu ray is housed in its own plain white, embossed sleeve. 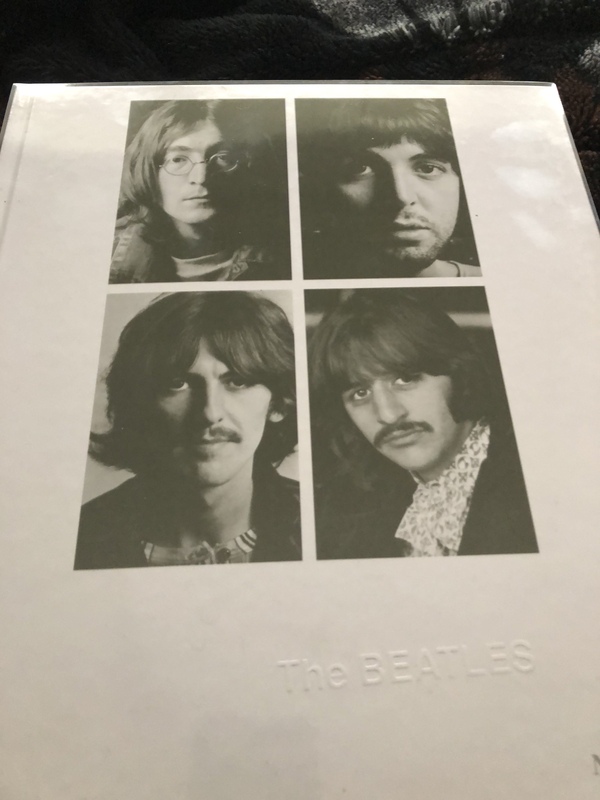 The discs are housed on either side of a remarkably detailed book full of photos, track listings and instrument assignments for each tune, essays, and stories about the artwork and release of The Beatles. The book is every bit as comprehensive as the one found in the Sgt. Pepper’s Lonely Hearts Club Band box. Lord only knows when I’ll have time to read it all. But it’s really nice to know it’s there. As I said, The Beatles were in a bit of turmoil when this album was recorded. Every band member was not present when some of the songs were recorded; Yoko Ono had begun to hang around during the sessions, for better or worse; and for a brief period, Ringo Starr left the band, forcing Paul McCartney to take over drum duties. The liner notes are great for keeping track of just who played what on each tune. It’s also a great way to document the way the band used the studio as an instrument, keeping them on the forefront of recording and the technology connected to it. We are also treated to individual color photos of the band, like in the initial album release, and a poster depicting the other artwork found in the original packaging. The relative simplicity of the art makes it easier to focus on the music, which is why we showed up to the party in the first place. Giles Martin is truly his father’s son, with a keen pair of ears and the ability to make a 50-year-old album sound brand new. The new mix doesn’t strike me as being as revelatory as Sgt. Pepper’s, but it’s still very, very good. The word I keep coming back to is cleaner, with a bit more detail than the original release. The instruments I was used to hearing sound a bit clearer, and some of the sounds originally relegated to the background have been brought forward. It’s a very modern take on a classic album. Non-completists may not appreciate the rehearsal and demo discs, but they’ll be missing out on hearing the band members talking to each other and getting the tunes in shape. They’ll also miss rehearsals on music yet to come, like “Lady Madonna,” “Hey Jude,” and “Across the Universe.” But for people like me, the process can be as exciting as the finished product, making it well worth the effort. My sole complaint with this set is the absence of any video. Surely Giles could have gotten McCartney, Starr, and even Ono to talk about those sessions, the turbulent times inside and outside the studio (1968 was a pivotal year for mankind the world over), and the effort it took to make The White Album a reality. I, for one, think that would’ve made for a great documentary. This is a collection designed for true Beatlemaniacs and completists. More casual fans would be better off picking up the remixed album alone, which is available. For the rest of us, plop down that $150, and dive in! The 50th anniversary of both Abbey Road and Let it Be are right around the corner. I can only assume a box set for one or both albums is inevitable. And I’ll be right there, cash in hand, for my copy. I just hope I can get the other books read first. That box set surely looks beautiful! I’m a longtime Beatles fan, yet I’m still on the fence whether and, if yes, which configuration I should get. The White Album isn’t my favorite Beatles album, plus I don’t have the ability to listen to 5.1 surround sound at home. The most intriguing material to me are the Esher Demos, which I can get on my streaming service. Ikea makes wonderful shelves. The Billy’s are storing my collection nicely. A very informative book at that! Followup: I am kind of blown away by the separation of instruments in this new mix. More Paul and Ringo? I think so. Or maybe I’m projecting. No, you’re not wrong. The mix had definitely been spread out. And remarkably so!